The city of Chang’an – now known as Xi’an, has served as the capital for around 13 imperial dynasties in China. Today, many stories describing the charm of the bygone times revolve around the city. One such story is the Song of Unending Sorrow, describing the history of emperor Xuanzong and his concubine Yang Yuhuan. Ancient Xi’an (then Chang’an, in northwest China) has always been a centre for emperors, poets and warriors. Though those times may have ended, some anecdotes have managed to stay alive till date to tell the story of this ancient city. One of the most famous stories is that of Emperor Xuanzong, the seventh emperor of the Tang dynasty and his concubine Yang Yuhuan. A short drive to the eastern countryside took us to Mount Lishan. The beauty of the Huaqing Palace surrounded by these mountains was set as backdrop for a Chinese historical drama named – The Song of Everlasting Sorrow. Three days a week from April to October, Mount Lishan in the Shaanxi Province is lit with lights and lamps for presenting The Song of Everlasting Sorrow on the Nine Dragons Lake at the palace. The Song of Everlasting Sorrow, also known as the Song of Unending Sorrow, is a narrative poem by Bai Juyi, a famous realistic poet of the Tang Dynasty that describes the love story of Xuanzong and Yang Yuhuan. The poem has been adapted with one prelude and ten scenes, telling the love story in four parts – from falling in love to their reunion in fairyland. 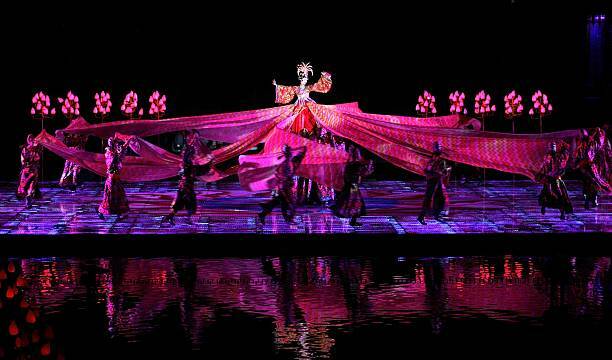 The close to one hour show starts after the sun set, amid advanced sound and light technology and especially-designed stage that partially remains submerged in water. 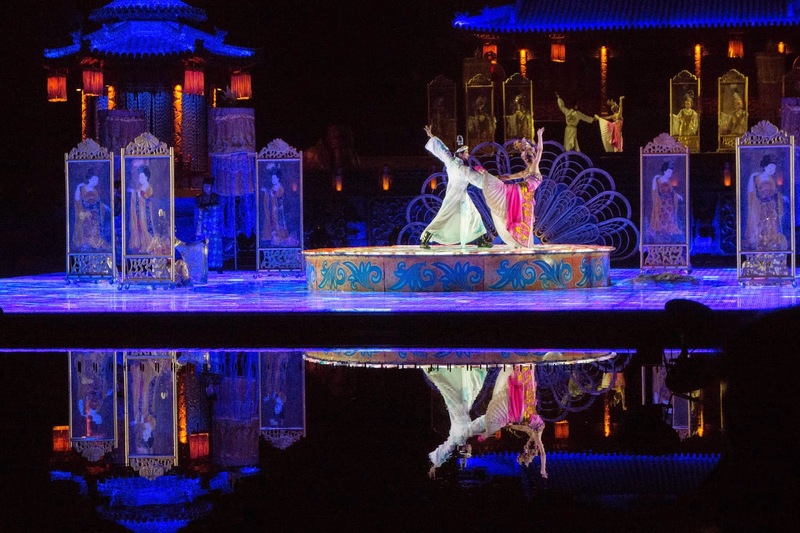 The place is filled with glorious lamps, beautiful curtains and charming dancers and singers for the show that combines music, lighting, dance and lavish costumes. Close to 300 artists perform on the surface of a lake that boasts of a 700 square-meter foldable soft LED screen, laser effects, fireworks, fire-effect technology engulfing the water with burning flames, video projectors creating flickering stars and fog rolling down a make-believe cascading waterfall. According to the story, Yang Yuhuan’s beauty outshined other ladies in the palace and emperor Xuanzong was enraptured by it. Soon, the ceremony of conferring the imperial concubine title was held and their love story began. Both of them were happily married until An Lushan – a court minister met the emperor and his concubine. Lushan waged a rebellion and all the important military bases were occupied, leaving the capital city in danger. We couldn’t understand the narration in Chinese, but according to the poem, as the war broke out, the emperor flee with his concubine to save her. Witnessing that the emperor was neglecting the world ever since he met Yuhuan, and that he is distracted even from the war, the ministers and other guardians insisted on killing Yuhuan to save their territory. She was eventually hanged. The story then fast-forwards to a windy day when in his dream, emperor Xuanzong returns to Chang’an (present day Xi’an) and meets the concubine. Numerous white pigeons fly in the sky celebrating their reunion. The story was criticised by Confucian scholars for misshaping people’s perception of what happened to Yuhuan and the light in which her death was portrayed. The masses loved the poem though, and it became a best seller when it was published. Today, The Song of Everlasting Sorrow is an important part of many syllabuses for students in China. You thought Diwali firecrackers were crazy ? Discover Taiwan Lantern festival's madness !